From traditional Sephardic melodies to Latin-influenced originals by way of Thelonious Monk and Jelly Roll Morton, to an Irving Fields arrangement from the classic ’50s Borsht Belt mambo/cha-cha album, Bagels & Bongos, Anthony Coleman takes a radical approach to the classic jazz piano trio. 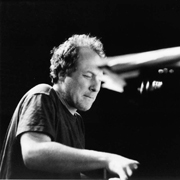 Pianist Anthony Coleman has worked with Marc Ribot, Glenn Branca, and the Krakauer Trio, and has performed and recorded with John Zorn since 1979. He has a previous album as a composer/performer on Avant (Japan) and two albums as a duo with Jazz Passengers’ saxophonist Roy Nathanson on Knitting Factory Works. Coleman also composed “Below 14th St. / Above 128th St.” for Guy Klucevsek’s Manhattan Cascade (CRI).